Begin your European vacation before your cruise with an overnight stay and sightseeing in Bucharest, including the Royal Palace Square and Romanian soldier remembrances. You’ll continue to Transylvania for two nights in Brasov for a guided tour by day, and a visit to Dracula’s Bran Castle by night. Drive into the Carpathian Mountains to visit Peles Castle. Enjoy superior hotel accommodations with breakfast, expert Local Guide, and transfer to your ship. Travel to Fetesti to embark on your Danube River cruise, beginning with the Danube Delta preserve. Sail through the striking landscapes of the Balkans—Rousse, Bulgaria, Veliko Trnovo, and Arbanassi, one of the oldest towns in Bulgaria. Guided sightseeing in Vidin is followed by a guided tour of Belogradchik, with its ancient rock formations on the Balkan Mountains. After cruising through the narrow Iron Gates Gorge, visit Lepenski Vir for ancient archaeological finds. In Serbia, take a guided tour of Belgrade then see the most preserved Croatian fortress in Osijek. Attend a performance by the Franjo Kuhac music students, and tour the historic town of Pécs before exploring the Hungarian capital of Budapest. Tour Vienna’s historic Habsburg Empire—including the Imperial Palace, Vienna Opera House, and St. Stephen’s Cathedral. 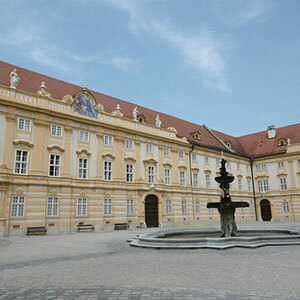 Visit delightful Dürnstein and Melk in the vineyard-rich Wachau Valley. Take a guided tour and hear the legendary tale of King Richard the Lionheart in Dürnstein, and tour the magnificent Benedictine Abbey high above Melk. Your European river cruise continues with sightseeing in Passau, the “City of Three Rivers”, and Regensburg, to see the 179 AD entrance to Castra Regina fortress. You’ll dock in Roth for guided sightseeing of the Bavarian town’s timbered houses, or choose an excursion to tour Nuremberg’s historic sites, including Kaiserburg Castle or the Nuremberg Rally Grounds. A historic river cruise in many ways! Continue your European vacation your way with two nights in the golden city of Prague. Guided sightseeing includes Hradcany Castle grounds, St. Vitus Cathedral, and Old Town’s Astronomical Clock. Enjoy free time as well to explore this exquisite city.